Plantar fasciitis is a common source of foot pain. The pain may sometimes be diffuse and be confused with the ankle pain. The plantar fascia is a fibrous aponeurosis (a thick cord-like tissue). It originates off the calcaneus or heel bone and fans out to attach to the plantar surfaces of the phalanges bones (foot bones). 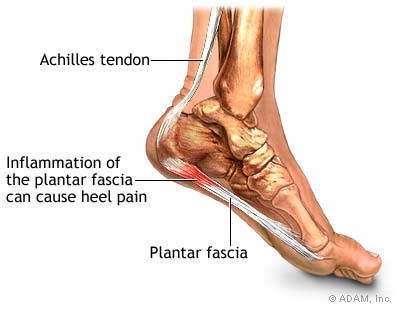 It may be along the mid or distal aspect of the fascia, as it connects to the foot bones or in the middle of the heel. Select arthritis that are not degenerative in nature, such as the zero negative spondyloarthropathies (Reiter’s disease or ankylosing spondylitis). The plantar fascia may either be caused by an inflammatory process or there may be an underlying degenerative process, such as seen in tendinopathies where there is thickening, scarring and abnormal collagen formations. Rupture of the plantar fascia may occur with an extremely forceful injury, usually in the mid portion of the fascia. Plantar fasciitis is sometimes confused with a bone spur that is on the calcaneus, but this would be an incidental finding. It is diagnosed with careful physical examination. Tears of the fascia and degeneration can be seen on an magnetic resonance imaging (MRI) study and ultrasound testing. Conservative physical measures and modalities may help reduce the inflammation, especially in the milder cases that are due to repetitive stress. These measures would include rest, massage therapy, stretching, night splints, and physical therapy. If these do not reduce the inflammation, other measures such as cold therapy, orthotics, anti-inflammatory medications, and injection of corticosteroids would be the next step. In extreme cases, surgery may be appropriate. However, if this chronic process is not responding or is creating scarring in the fascia, an alternative treatment to consider would be platelet-rich plasma (PRP) and stem cell therapy. Platelet-rich plasma (PRP) and stem cell therapy are regenerative medicine techniques which may regenerate tissues that are chronically irritated and inflamed or undergoing degeneration or scarring. With platelet-rich plasma (PRP) therapy, the healing and growth factors in a person’s own blood are captured and injected into the injured area. This may help to heal the damaged tissue more quickly. If you suffer with plantar fasciitis and your current treatment plan leaves you wanting an alternative, perhaps a fresh set of experienced eyes can change your outlook. Since 1990, Dennis M. Lox, M.D has applied his personal interests in sports medicine, cutting-edge regenerative medicine and chronic pain management to helping patients increase their quality of life. Contact us for an appointment at 727-462-5582.